We are one of Chinese Wood Pellet Stove companies,who have specialised in the design of Pellet Stove Fireplace Inserts and Pellet Stoves Fireplace.We have Pellet Stove For Sale. Henan Kingman M&E Complete Plant Co.,Ltd is one of China's Wood Pellet Stove companies,who specialised in the design of Pellet Stove Fireplace Inserts and Pellet Stoves Fireplace. 1. Automatically powers off when temperature is below 50°C. 2. When the temperature is higher than 95°C, the control system will stop inputting pellet fuel and will shut off. 3. If the pellet fuel does not burn properly, the pellet burning fireplace will shut off automatically. 4. If a short circuit occurs, the pellet burning fireplace powers off automatically. 1. Automatically powers off when the temperature is below 50°C. 2. When the temperature is higher than 95°C, the control system stops inputting pellet fuel and shuts off. 3. If the pellet fuel does not burn properly, the pellet stove fireplace inserts shut off automatically. 4. If a short circuit occurs, the pellet stove fireplace inserts power off automatically. 1. Pellet stove fireplace's fuel: The present model can only burn pellets. The pellet stove fireplace next year will be able to burn with other fuels such as corn. 2. The material of the pellet stoves fireplace is steel. The temperature of the glass can reach 800 degrees Celsius. 3. The pellet stove has an electrical cabinet; it is electronically controlled. 4. The hopper in the pellet stove can be loaded with 20 kilograms of material. 5. The pellet burning fireplace is fed automatically. 7. The difference between the 33B Pellet Burning Fireplace and the 33C Pellet Burning Fireplace is the style; the 33B is free-standing while the 33C is inserted. The freestanding pellet burning fireplace can be located at different places in your home. It includes a vent blower, controlled drill feeder and automatic switch. Pellet stove fireplace, quantity: 48 units in one 20’ FCL, 90 units per 40"
This model pellet burning fireplace is newly developed, similar in design as the GCFlame, but at a lower price. 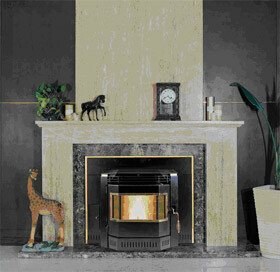 Pedestal freestanding pellet stove fireplace, designed with an attractive flame pattern. Its simple and compact finish confers cleanliness. 1. The pellet burning fireplace will shut off when the fire goes out and the exhaust temperature drops below 120°F (52°C)..
2. The pellet burning fireplace has a high temperature safety switch. If the temperature on the hopper reaches 200°F (93°C), the auger will automatically stop and the stove will shut down when the exhaust temperature cools. 3. The pellet stove fireplace has a convection fan control over-ride. This function causes the convection fan to reach its full speed when the temperature at the back of the firebox reaches 160°F (71°C). 4. If the power goes out, the pellet stove fireplace will stop running. When the power comes back on, the pellet stove will not restart unless the exhaust temperature is still above 120°F (52 °C). Pellet Burning Fireplace Quantity: 42 units in one 20’ FCL, 90 units per 40’.